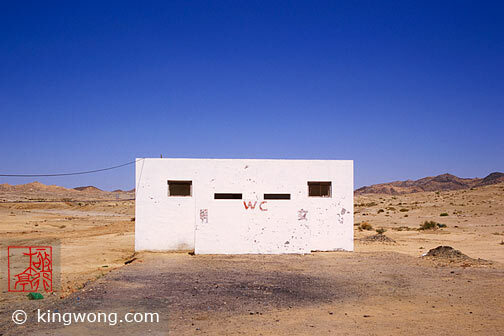 A bathroom in the desert. Men on the left and women on the right. Inside are slots on the floor where the wastes can drop down a six-feet pit. I don't remember the length of the slots, but one can move back and forth only so much to awoid the historic craggy peaks rising from below. And being civilized, we cover and suffocate ourselves instead of just finding a beautiful spot in the open and enjoy the landscape in the process. There is of course no water here.